I gave my closet a little revamp and re-shot the space a few weeks ago!! 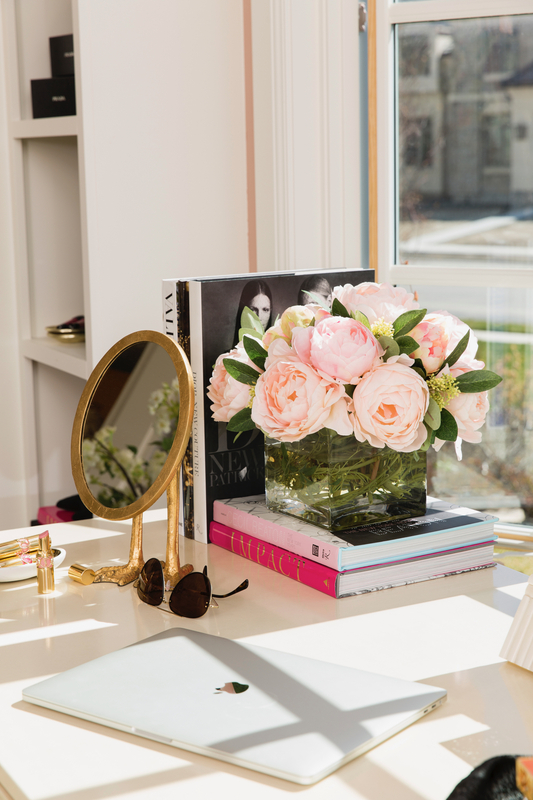 You can read more about my closet and the thoughtful design details in a feature that went live on Elle Décor yesterday here (pinch me)! Let me know if you have any questions about any of the accessories or furniture pieces. Thanks for stopping by, hope you have a great Tuesday! All other furniture and accessories from my closet can be found here! Designed and styled by Alice Lane Home. Definitely dream closet status :). Love it! Hopping over to Elle Décor now to check out the article. Thanks for sharing! 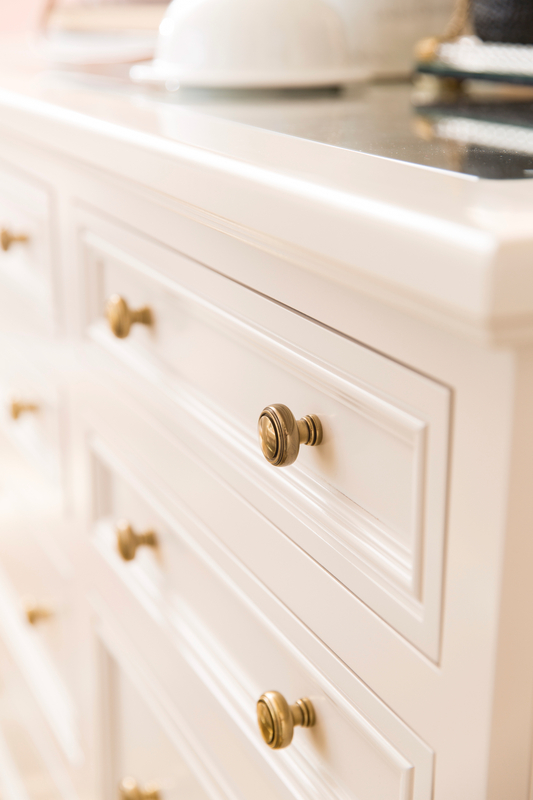 Such a beautiful chest of drawers, want one ! Such a gorgeous space, lady! Totally obsessed! 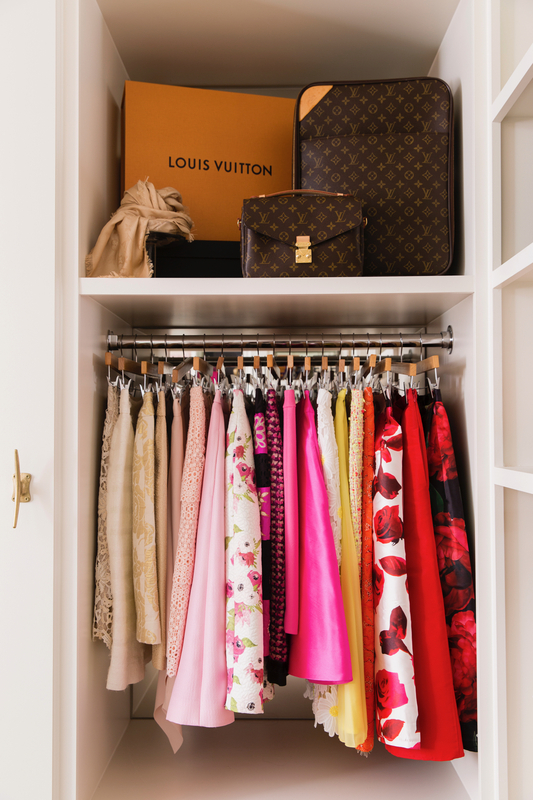 Seriously closet goals! I love it more than ever and it’s so you. <3 thanks for sharing! Thanks Deanie!! I was so excited about it because I love ELLE Decor so much! Such a beautiful closet! I love the way everything is organized! What a fun space to get inspired!! Love all the subtle touches! OMG! closet envy. this is goals! I only wish I could be this organized and coordinated. And the shoes!!!! I love your closet! Oh no! They are all appearing for me? I’ll look into it, thanks so much for letting me know! Your closet is just to die for!!! It looks amazing ? This is absolutely stunning! All I can say. I love your closet. I would take it as my entire house if I could! Haha! Gorgeous shoot! Wow! 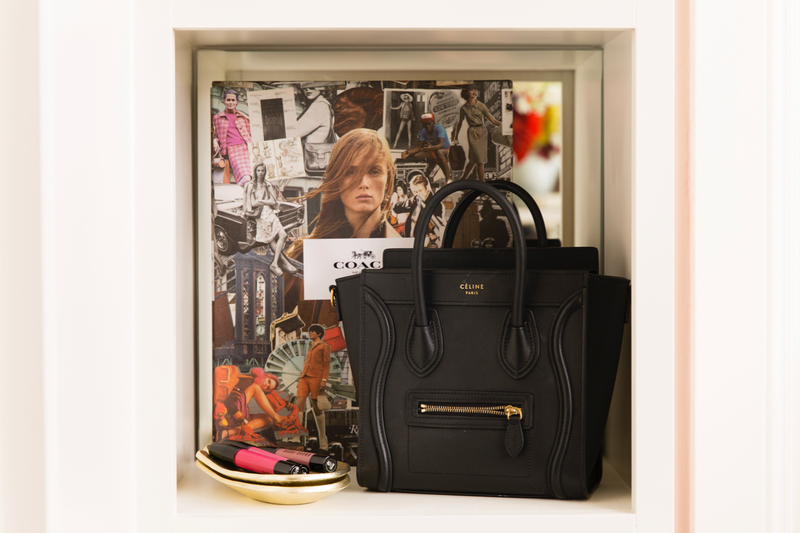 What a gorgeous closet, Rach! You did a marvelous job. I can’t imagine walking in there and not knowing what to wear, so many beautiful choices and inspiration, haha! Thanks for sharing and I hope you have a great week ahead! Love your closet! 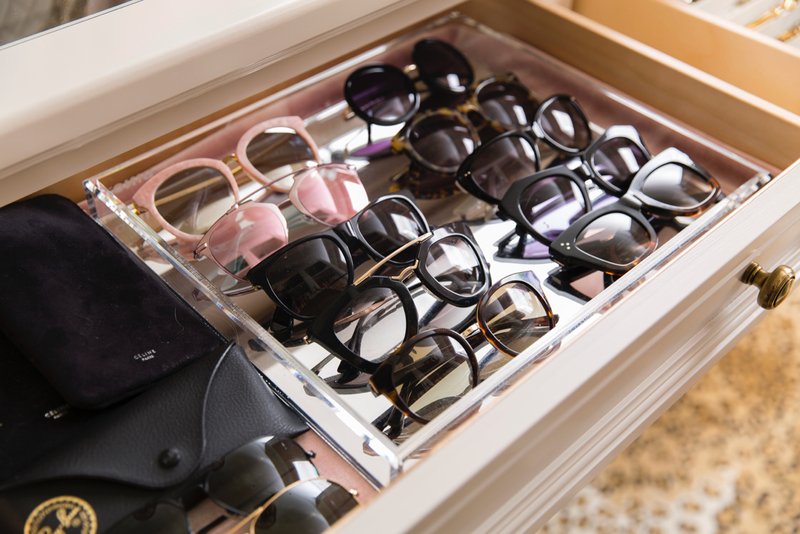 Where are your jewelry organization boxes from? Hi Kat! I believe they are available at alicelanehome.com! So stunning! My favorite detail are the little arms coming out of the wall with bracelets on them! Same! Where are those from, I don’t see them credited here or on Alice Lane’s site? 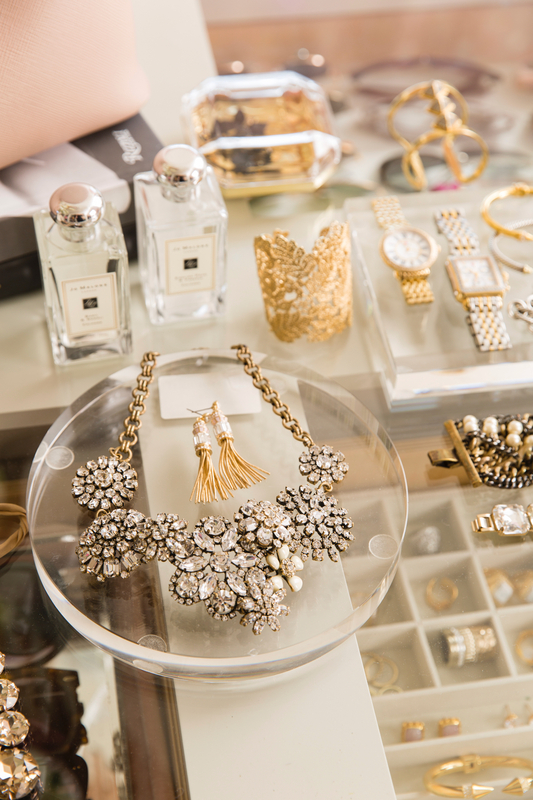 Your closet is stunningly beautiful. It looks like an exquisite boutique. Oh thank you Lizzie! I’m happy to hear that! This is so incredibly gorgeous! I love all of the jewelry displays! holy closet goals! I couldn’t even dream of a closet so beautiful, and filled with such amazing clothes/shoes/bags. Haha thanks Chelsea :) You’re sweet! You have a beautiful closet! I love the white dress that appears in Pune of the pictures. Is it available in your website? ah your is so well organized specially the shoe rack!its perfection! Hi Shawna! I believe they are available at alicelanehome.com! #closetgoals I am so obsessed with this closet! I love it! So dreamy with the pinks and whites! Thanks Natalie :) You’re sweet! LOVE the wooden arms as jewelry hooks. Genius! Thanks Megan! They’re kinda fun! PS: that chandelier and shoe closet is EVERYTHING! Closet goals! Everything is stunning, you really did a fantastic job! Hi Claz! I usually keep my out of season clothing in a different closet in our home and swap them out as the seasons change :) Hope this helps! Such a dreamy closet! Love how feminine and beautiful it looks! Wow your closer is beautiful!! Well done! My closet is in desperate need of a refresh. Love the arms coming out of the wall with the bracelets!! Where are they from???!! I love everything in your closet! It’s beautiful! I especially loved the butterfly in that picture frame :) was it a gift or from a store? Thanks Chantelle! You can get it from alicelanehome.com! Wow that closet is GORGEOUS and the absolute definition of goals! Obsessed. Hi! I love all of the dresses and skirts you wear! My question is do you put clothes in storage that you aren’t wearing to save for your daughter? I’m having a hard time cleaning out my closet because I want to save everything for my baby girl! I use another closet in our home to store some stuff right now!! I am so in love with yours! I am obsessed with your style and your amazing girly, classy closet all white and blush colors looks very delicate at same tiime elegance! 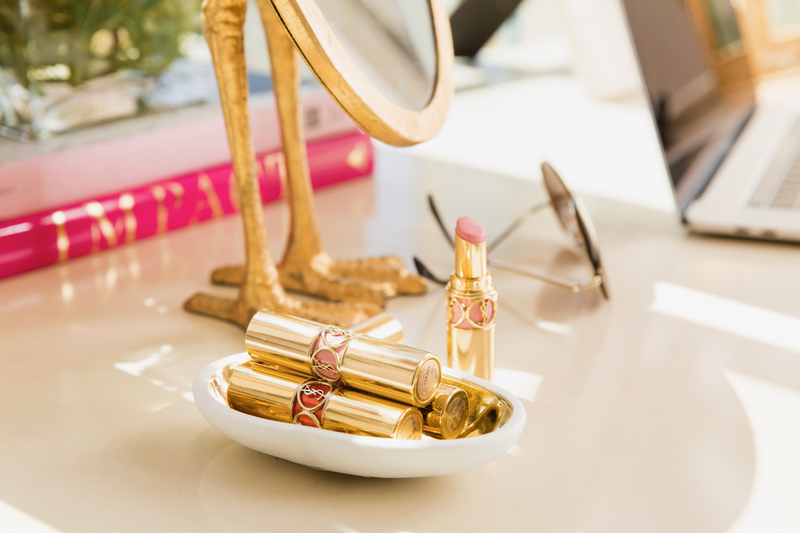 Thank you for sharing your beautiful blush closet! Thanks Maribel! You are so sweet! Your closet was beautiful then and it’s beautiful now, Rach! I’m currently editing mine to whites, creams, neutrals, black, grey and blues myself. So crazy how I remember some of your outfits over the years just looking at some pieces you have in your closet! Haha thanks Huong!! 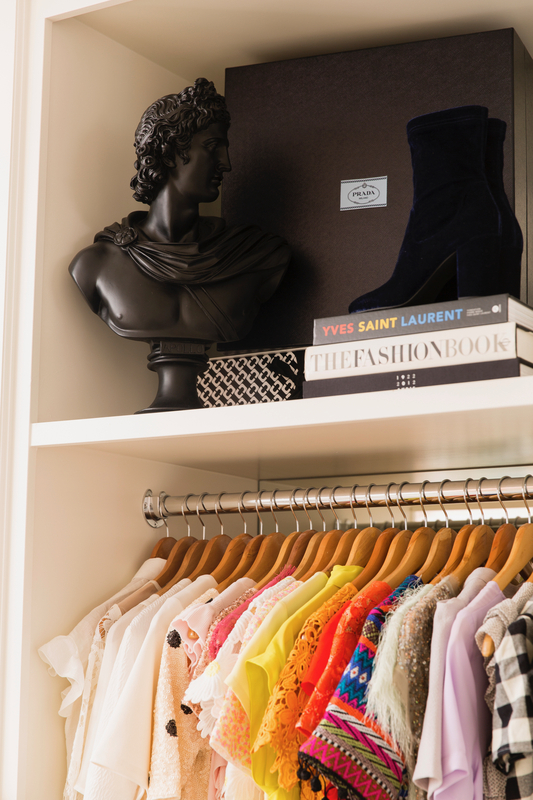 How is your closet editing coming along? It was hard for me to part with some pieces! Wow, congrats Rach. This is a testament that when you commit to something you love, love and abundance commits back to you in strides. It has been a long time coming. You so deserve it. Job well done. 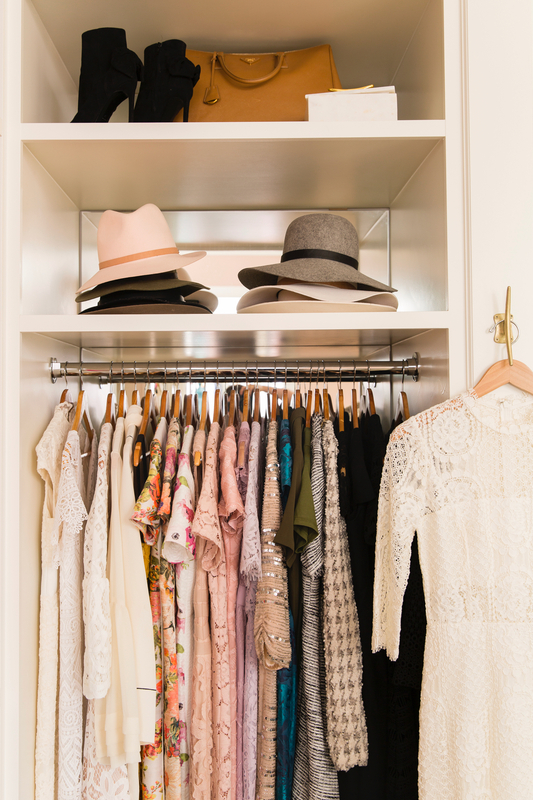 Your closet is truly a dream! I know all you can do is sit back, smile and admire all of your hard work. Congrats to you and one day I shall be on your level! 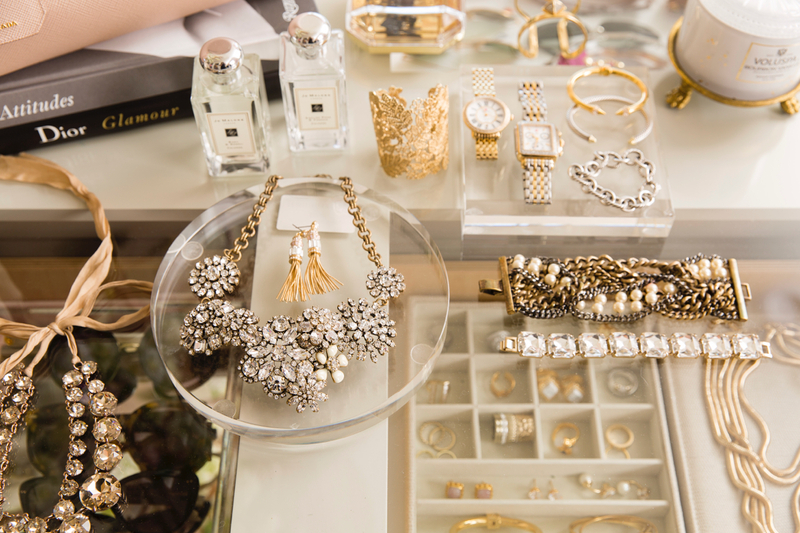 Rachel, your closet is a dream! Everything is absolutely gorgeous, from the beautiful furniture to the lovely display. I love how perfectly everything goes together. It’s just stunning, that’s all I can say. Hi Alex! I need to check, but I think the Container Store has something super similar! Hi Alex! I can’t remember off the top of my head. Let me find out and I’ll get back with you!! Hi Rachel, congratulations on your Elle Decor feature! Your closet is so beautiful. Please let me know what is the brand of your long sleeve floral blush/light pink blouse. Thank you. Thank you Claudia! It means a lot! This is just STUNNING! Every detail to every piece! Beautiful closet rach!! I was wondering where you also got your chest of drawer or your “island” in the closet? Is it also from Alicelane? I was wondering where the black necklace/jewelry bust came from? It’s not on the Alice Lane website. Love, Love, Love, the closet!!! Question, What is the shelf spacing distance for your shoes and then for your boots? This closet is a dream! Loving how you re-did it! 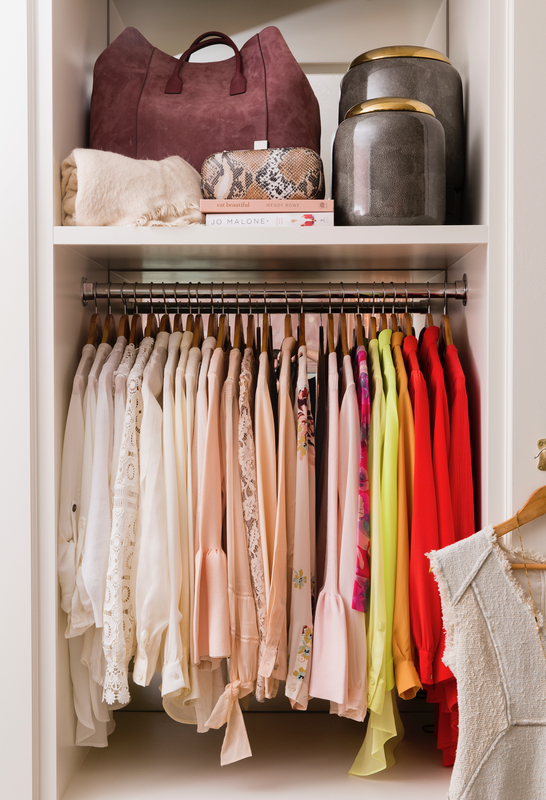 Your closet is just beautiful! Would you mind sharing where the frames on your desk are from? Thanks! Everything is absolutely stunning! I am wondering if you could tell me what brand the shoes are that are on your Gucci book? The pink and gold with jewels on them. My sister is getting married this year and her theme is a dessert/boho/arizona type vibe. Those shoes would be gorgeous with her dress! if i had to design a closet i would literally design it like this! i wouldn’t even change one thing!!! i am totally obsessed with you, you taste, and everything you do and wear…. just everything about you!!! thanks for being you!!! love you Rach!!!!! i am 19 yrs sold and I’m a Realtor in NY and i have a big insecurity that people think i look like I’m 10yrs old and i always look at your social media and i buy the types of things you wear that are so classy and beautiful and it makes me feel so much older and put together! so i thank you for that too!!!!! Oh my gosh, what a sweet comment!!! Thank you so, so much. It means a lot :) Best of luck to you! Hello! I was wondering if you could share where you found your brass kitchen faucet/over the stove water spout. Thanks! wHERE DID YOU PURCHASE THE LEOPARD CARPET? i LOVE IT!